Wrestling between being a college canteen and a typical highway shindig, Shibiya dhaba is killing it with their massive tandoori paranthas and thick malai lassi. This place sits right next to Manav Rachna University on the Surajkund – Faridabad route and also doubles up as the unofficial university canteen. 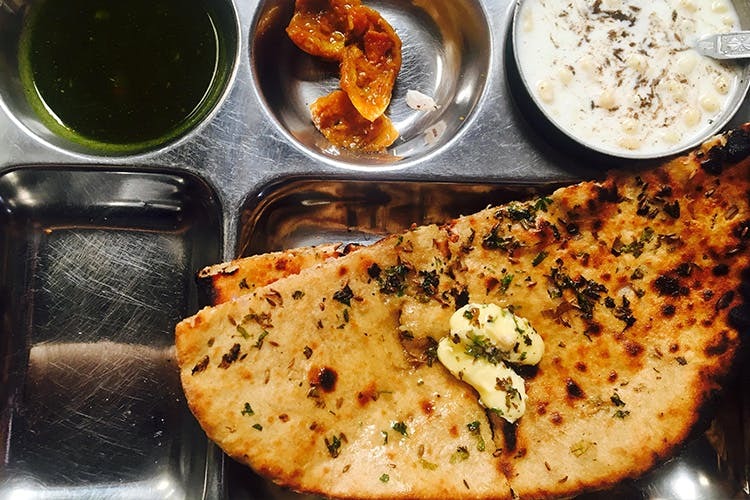 The menu is huge but what works for the place are the massive, two-layered tandoori parathas, served with a big dollop of butter. With all kinds of stuffings, such as the classic aloo pyaaz and gobi, we find ourselves steering towards the paneer pyaaz and the mix vegetable ones. It is a vegetarian establishment but they do make exceptions with egg versions of all these parathas. These are served with a bowl of raita, green chutney and lemon pickle that will remind you of the kind your grandmother makes. Like every dhaba, the huge pateelas will not go unnoticed and will leave you wondering what’s on the menu today. Order the dal makhani and the tandoori roti thali – we all know what a deadly combination that is. The dal is creamy and the flavours sit just right and, of course, the butter runs wild here too. We happened to visit the dhaba on a rainy afternoon and couldn’t resist ordering the kulhad chai which was being prepared fresh. This tea was an absolute winner – strong and rich, with a touch of clove. It’s a dhaba you might want to do a short drive to on a lovely day. The winding roads are a great escape and the stopover will be worth it. The road is connected via Gurgaon – Faridabad toll road and, if you’re coming from south Delhi, take the Karni Singh shooting range road.